I have a confession to make: I spend an unhealthy amount of time watching makeup tutorials on YouTube. But it’s not my fault. If my mother hadn’t let me parade around like a clown when I was in the 7th grade, I probably wouldn’t be as obsessed with trying to look normal. The good news is that, throughout the many (many) nights I have sat at this desk searching for the best tips and tricks to help me fool people into believing I’m not a troll, I stumbled upon Wayne Goss’s channel, and I immediately fell in love. I’ve learned so many fantastic makeup tips and tricks from his tutorials, and decided I had to share my favorites with all of you. These clips will teach you everything you need to know – how to hide acne scars, how to make your nose look smaller, how to cover dark circles – and more! 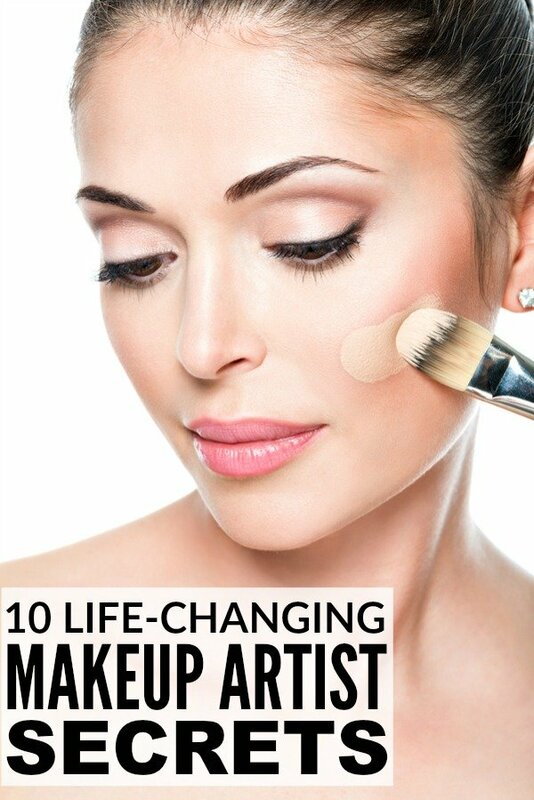 RELATED: LEARN HOW TO APPLY MAKEUP LIKE A PRO! Of course, makeup artists tend to recommend products that are a little on the pricey side, so I’ve included suggestions on more affordable options I’ve tried and tested myself so you can give these makeup artist secrets a try without breaking your bank account. Most of these items are available at your local drugstore, but in the event that you prefer to order everything online like me, I’ve included affiliate links as well! If your foundation has a tendency to disappear from your face by the end of the day, give this trick a try. It goes against everything I’ve ever learned about applying dry make-up before wet make-up, but it really, really works! Here are affordable product alternatives I used when testing this makeup hack out – you can click the image or the links below to find out more and/or purchase each item! Want perfect eyeliner, but can’t seem to master how to apply it properly? Then this trick is for you. It took me a few tries to figure out – I started with a charcoal eye pencil and worked my way up to a gel eyeliner like Wayne suggested – but it really does work! If the teenage years were unkind to you and left you with acne scars, this quick trick on how to smooth your skin and make acne scars disappear will change your life! Remember not to use makeup that will make your face glow as it will draw attention to your problem areas. Matte is a must! You can order a bag of 100 Wonder Wedge Cosmetic Wedges on Amazon for less than $7 (essential for this trick of Wayne’s! ), and if you suffer from oily skin, we’ve tested heaps of different mattifying products and put together this list of the best foundations for oily skin, all of which cost less than $30. This quick tip on the relationship between the positioning of your brow and the size of your nose has been a game changer for me. In fact, the first day I used this trick, someone actually stopped to tell me I have a nice nose. I’m not kidding. I’m fortunate enough not to have puffy bags (yet), but I am amazed at how easy and effective this tip is. Give it a go and you will be amazed at how much it transforms your face! The only challenge I have when it comes to using under-eye concealer is that it often dries out my skin and looks unnatural. I’ve tried a bunch of different options in the last several months, and the only one I ever have luck with is the Smashbox High Definition Concealer. I use it very sparingly and never apply power overtop, and I’m always pleased with the results. If you have large pores like I do, and find applying foundation can sometimes make them look MORE noticeable, this easy and awesome tip will give you that flawless look you’ve been looking for. It has made a HUGE difference in my look, but I do need to exfoliate and moisturize my skin beforehand or it causes my skin to look flakey and dry. I’ve featured the products I use to successfully pull this genius trick off below – you can click on the images or the links to find out more! If you hate clumpy mascara as much as I do, you will LOVE this trick. I actually had an eyelash comb in my makeup drawer from a gift set a friend gave to me a couple of years ago, but I never knew what to do with it. But after giving this idea a try, I am amazed at how beautiful and curled my lashes look and I’ve never looked back. Give it a go! For whatever reason, my undereye area has always been problematic for me. The skin is always too dry, and concealer always creases and/or settles into my fine lines and looks cakey and unnatural. But after using the products below to ensure my skin is moisturized and primed, and then following up with this genius tissue trick, my concealer looks AMAZING. If you have a tendency of botching your eye shadow like I do, this trick will save your life! If you’re a tired mom like me, these tips for applying concealer are JUST what you need! If you’re a fan of fake tanner, but hate the orange glow it leaves on your skin, check out this REALLY EASY tip on how to make it look more natural. You can thank me later. And if you’re new to the world of self-tanner, we’ve put together a list of great tips to teach you how to apply it properly so you can get a natural, smooth-looking tan without subjecting your skin to the sun’s harmful rays. If you found these makeup artist secrets helpful, I hope you’ll share them on Pinterest! And if you’re looking for more makeup tips and tricks, my Beauty board on Pinterest is a great place to start! I’ve watched his vids for years and love his stuff. I’m about to turn you on to your next faves, two sisters who are makeup artists and go by pixiwoo. You will love Nic and Sam! Check them out. if you smell Ozone get down, or sohiemtng to that effect. For one, who knows what Ozone smells like. For two, if a bolt of lightning is going to hit that rim, and your on it, good luck.